Listening to Amy Winehouse as she would have sounded in the late-1800s is surreal. Hearing her sing “I told you I was trouble. You know that I’m no good” doesn’t have the same impact when it’s coming from a gramophone. 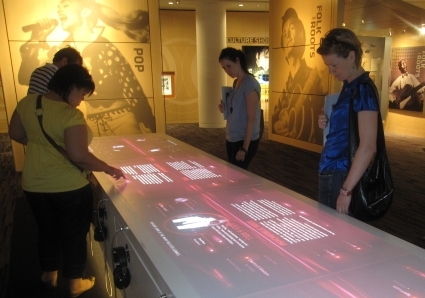 From Mono To Surround is an intriguing exhibit in the recently-opened Grammy Museum that allows you to hear how technological advances have changed the way we listen to music. Select one of four well-known tracks then choose to hear it played through the original Edison wax cylinder phonograph, or stereo LP, compact cassette or high definition 5.1 channel surround sound. Predictably, there’s a noticeable improvement in quality at each stage. Apart from the last. Switch from surround sound to the format in which most of us now listen to music MP3 through ear buds and there is a stark drop in quality. Technology has made our music more portable but at what price?